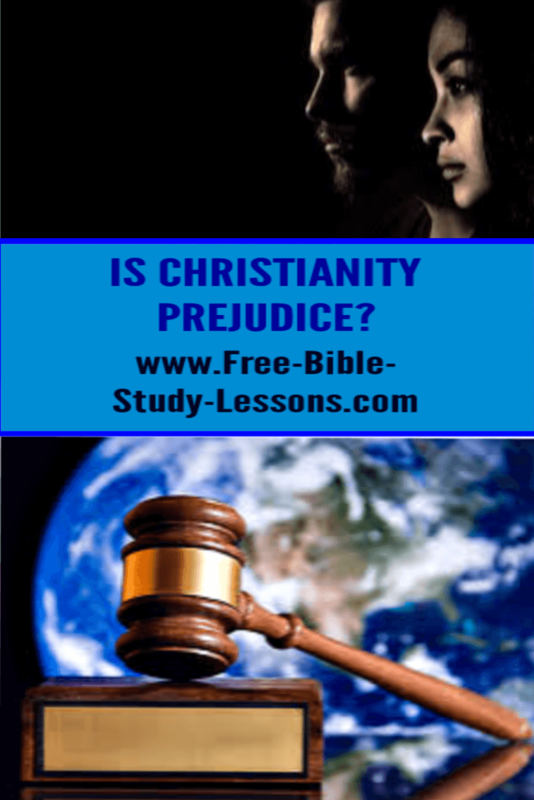 In this modern world Christianity and Christians are often looked upon as being prejudice. If it is not directly charged it is implied almost in the daily fabric of humanist society. Movies, TV, newspapers, magazines, enemies, friends, employers, employees, court system...the unwritten accusation is all around. Let's begin by recognizing this is a trick question designed to intimidate Christians into silence. No one likes to be looked on as prejudiced or intolerant, which is then equated with being unloving and closed-minded. Why is this a trick question? Because there is no such thing as total toleration. EVERY person, group, and religion tolerates certain things and is prejudice against other things. For example, the humanists, who preach toleration, are extremely prejudice against Biblical Christianity. Here is an example from the physical world. People in the construction industry are intolerant...yes, even prejudiced...against using bubble gum to join the studs in walls together. Imagine that! Maybe the bubble gum manufacturers should file a law suit against such close-mindedness. Yet, strangely enough, when I am buying a house I am glad for that prejudice attitude. Ridiculous example? Yes, and yet no more foolish than charging Christianity with being prejudice for standing against certain activities that the Bible declares destroys people and societies. It is the humanists who are trying to build a world using bubble gum to hold it together and loudly cry "intolerance and prejudice" against anyone who would oppose them. Often Christians are not confident enough in their own position to stand up and declare, "Your way doesn't work. You are murdering people and societies with your pretended toleration. And we will not stand by and watch it happen." So, since every person, group, and religion is intolerant of some actions, what is Christianity intolerant of? First of all, we have to discover what the Bible tolerates. Sometimes we make judgments based on personal preferences or bias rather than on the Word of God. The Word of God is our only standard. What is Christianity tolerant of? Note: the terms "strangers" or "aliens" in the Bible refers to those who are strangers to the covenant of God. In the Old Testament that was non-Isarelites. In New Testament terminology strangers to the Covenant are called non-Christians. From these and other Scriptures, we see that those outside of Christianity are to be treated with respect, love, and compassion. They are not to be oppressed or looked down on. Christianity is not prejudice against "strangers." They have the same right to the protection of justice and to be treated with respect. Christianity is not intolerant of people who are willing to live in peace. Christianity is also tolerant of a person's personal beliefs. No one is forced to believe in Christianity. Everyone stands judged by God not by man for personal thoughts and beliefs. Also there are some things which God requires of His own children that are not general requirements. In the above example, God required His people not to eat of animals which died naturally. However, that was not imposed on non-believers. In fact, the people of God could sell such animals to others, but not partake themselves. Modern examples would be church attendance and tithing. They are requirements for Christians, but not to be forced on non-Christians - although they will answer to God. On the other hand, there are standards which Christians have the right to expect others to live up to. Christianity is prejudiced against evil and those who promote evil. God's moral law applies to everyone and is the way nations are to be governed. Christianity is intolerant of things which murder society such as adultery, sexual perversion, murder [which includes abortion], theft, false witness, fraud, corruption, etc. Christianity is also intolerant of individuals who stand up to promote evil. Therefore, Christianity supports laws which outlaw evil and perversions which murder society. This applies to every society. Every group must support it's way of life or be destroyed. It is a war. Humanism must destroy Christianity or it will be destroyed and Christianity must destroy humanism or it will be destroyed. Christians often fail to understand this and so compromise with humanism thereby giving the humanists an edge. 1. Stand without compromising or be ashamed for the righteousness of Christ and the standard of the Bible. This will often lead to persecution - many times from WITHIN the Christian community. Even Jesus had more problems with the religious than the "sinner." 2. We need to have compassion and love the ungodly. We are not to be harsh or judgmental. We are to love people to Christ. The old saying, "He who serves, rules" is often true. Many times the best way to win is not a direct assault, but a gentle service - searching out and unselfishly meeting the needs of people. 3. We need to study the Word of God to know how God intends things to work. [The Biblical Law course is a good place to start.] Until we know how things are supposed to be we will never know how to work to get there. Many times we are simply pushing our own agenda or predudices instead of searching out and applying a truly Christian world-view. We need to study and pray for God's stragedy in every specific situation.